A one day workshop on “Awareness programme on potential of space technology and its applications” was organized today, the 27th September 2016, at Conference Hall, National Institute of Technology (NIT) Manipur, Langol, Imphal. 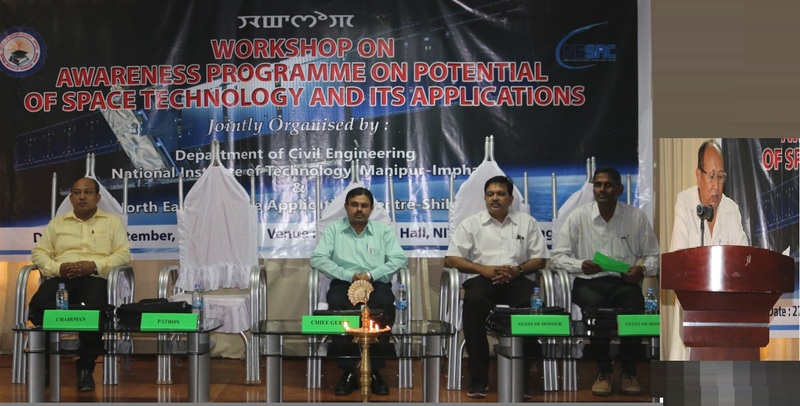 The programme was organized jointly by the Department of Civil Engineering, NIT Manipur and the North Eastern Space Applications Centre (NESAC) - Shillong, Meghalaya. The programme is a follow up of the suggestion made by Sri. A S Kiran Kumar, Chairman, ISRO during his visit to NIT on the 2nd Convocation in December, 2015 to organize a one day awareness programme on space technology and academic interface. Dr. P. Albino Kumar, Head, Department of Civil Engineering, NIT Manipur chair the inaugural programme and Dr. S. Birendra Singh, Director, NIT Manipur stressed on practical applications of space technology at the grassroot level. The workshop envisaged to impart knowledge about space technology and its application towards development activities in various fields. The workshop focused on the vision of Indian Space programme and highlighted the launch vehicles, satellite building, navigation, earth observation, planetary missions, space science, SATCOM activities, etc. The programme also included the demonstration of the geoportal web services for effective governance and viable benefits. The workshop was addressed by eminent Scientists and Professors from NESAC, SAC Ahmedabad, ISRO HQ Bangalore, IIRS Dehradun, Department of Earth Science, Manipur University. The chief guest Dr. N.M. Desai, Dy. Director, SAC, Ahmedabad, underlined the importance of satellite communication for societal and rapid development and NAVIC (Navigation with Indian Constellation). The Guest of Honours, Sri. PLN Raju (Director, NESAC), Dr. K. Ganesh Raj (Dy. Director, RESPOND, ISRO HQ) and Prof. Arun Kumar (Department of Earth Science, MU) highlighted the applications of space technology with special emphasis on the north eastern region of India; RESPOND programme of ISRO and a case study of Geospatial Technology in Manipur. Apart from the Guest of honour, Dr. S. Satish, Scientist, ISRO, HQ, focused on Indian Space programme and planetary missions through video conferencing. Hands on demonstration of geoportal web services for good governance and societal benefits in Bhuvan environment was demonstrated by Dr. Harish Karnatak, Senior Scientist, IIRS and also suggested the students to enroll in the outreach programme of IIRS. Dr. Arup Borgohain, Scientist, NESAC gave a talk on real and near real time weather observation for northeastern region using in situ and freely available data in the web. The knowledge of space technology is not easily accessible to a lay man and the workshop gave a brief idea about the present status of space technology in India with special applications in north eastern India. The programme was attended by more than 200 participants mostly from the students and faculties from NIT. Apart from that faculties from Imphal College, Manipur College, officers from state departments like DST (MARSAC, MASTEC), PHED, PWD, Forests, etc. attended the programme. The daylong programme ended with a panel discussion with the experts and queries from the participants and concluding remark by Director, NESAC.